Some random travel tips if you’re heading to Istanbul for the first time. The metro and tram systems are really easy. The bus is not quite so simple, since you have to buy tickets in advance from a shop. For the former, at each metro or tram station, you just buy a token for 2TL. You then take your token and put it in the turnstile, and walk through. Done. No proof of purchase required, etc. Take the metro/tram to wherever you want. (Although if changing from metro to tram, there’ll be another turnstile, so you’ll need a spare token. This will be important when landing at Atatürk airport – buy yourself two tokens so that when you change from the metro at Zeytinburnu, you’ll have a token to get you onto the tram towards the interesting parts of the city.) For the bus, you can’t buy tickets at the stops or on the bus – you need to have bought your tickets in advance from a convenience store or similar. Or, like we did, you can get on the bus, try to buy tickets, be waved to a seat, and then be gestured towards a convenience store near a later stop while the bus driver holds the bus so you can buy tickets and get back on. This move may or may not be easier if one of your travelling party is an attractive blonde girl in a short dress. Pretty much first thing when you get to Istanbul, take a Bosphorus cruise. It’ll show you the interesting bits of the city from the water, and give you an idea of what you’re going to see from there on in. You can take a short one (maybe an hour) or long one (all the way up to the Black Sea and back, if you want), and you can take them from Eminönü or Kabataş. You can probably get your hotel or hostel reception to help you pick one, or you can just head down to the water and pick one of the many many guys yelling out “Bosphorus, Bosphorus”. Regardless, get on the damn boat and sit there for a bit, taking in the view. In Sultanahmet, you have the Blue Mosque (Sultanahmet Mosque), the Hagia Sophia, the Basilica Cistern (which lots of people skip – don’t, it’s cool, and gives you a great opportunity to play with the various dials on your camera, if you’ve got a good one) and Topkapı Palace. Go early to avoid the lines, and if you’re dedicated, you can do all of them in one day, even if you’re being thorough. If you want to get out to the Rumeli Fortress (and you should – it’s really quite cool climbing around over its walls looking out over the Bosphorus), you’ll want to know that you can’t get there by tram. Take a tram to Kabataş, and get a taxi from there (it’ll probably cost you about 15TL each way). Be aware that taxi drivers won’t understand “Rumeli Fortress”. It turns out that “Rumeli” just refers to the Roman (European) side of the Bosphorus, and so given they won’t know the English word “fortress”, you’re really not giving them a lot of information on your intended destination. Which partially explains the bewildered and confused look on the face of the taxi driver that a friend and I encountered on the first day I spent in Istanbul. (The remainder of the explanation was that the guy was a complete nutter who felt perfectly at home gesticulating his disbelief at the evident stupidity of the person going the right way down a one-way entrance to the motorway as he – the taxi driver – sat blocking the road facing in obviously the wrong direction having just completed an illegal U-turn off the motorway to get there. But it’s OK, because the previous stretch of one-way road was navigated facing in the right direction, even if it was in reverse.) Anyway, the magic word is “Rumelihisarı”. If you want to see Dolmabahçe Palace, go early. The line gets long, and it moves very, very slowly. It’s a nice place to visit, but its guided tours only through the two buildings (the palace and the harem), and no photos inside, so if you were planning on spending a while capturing happy snaps of the beautiful parquet floor and chandeliers, well, bad luck. If you’re looking for a hostel, I can recommend Agora Guest House (in Sultanahmet, which is the tourist area, and with a fantastic rooftop terrace with views over the water) and Chambers of the Boheme (in Taksim, which is the nightlife area). I’m sure there are other great ones around too, but those are the two I stayed at, and I was comfortable and happy at both. When usıng a Turkısh computer at your hotel or hostel, try to remember that the Turkısh alphabet (and therefore keyboard) has letters that the Englısh one doesn’t. Including an ‘i’ wıthout a dot over ıt. Thıs wıll bıte you ın the arse when usıng the ınternet, because you’ll probably pıck the wrong ‘i’ all the tıme, whıch wıll make loggıng ınto gmaıl.com a lıttle tricky for you, sınce you’ll be at the wrong sıte. İt wıll also make all your Facebook posts look kında weırd. Roadside kebab vendors turn up late at night with carts and meat on a stick (see previous post). Oh God yes, eat your heart out. If they ask if you want spicy sauce, the correct answer is “yes”. You’ll obviously want to spend most of your time walking around singing “Istanbul (Not Constantinople)” to yourself. So, to save you some time and consternation, you can find the lyrics here: http://www.lyricsdepot.com/they-might-be-giants/istanbul-not-constantinople.html. You’re welcome. 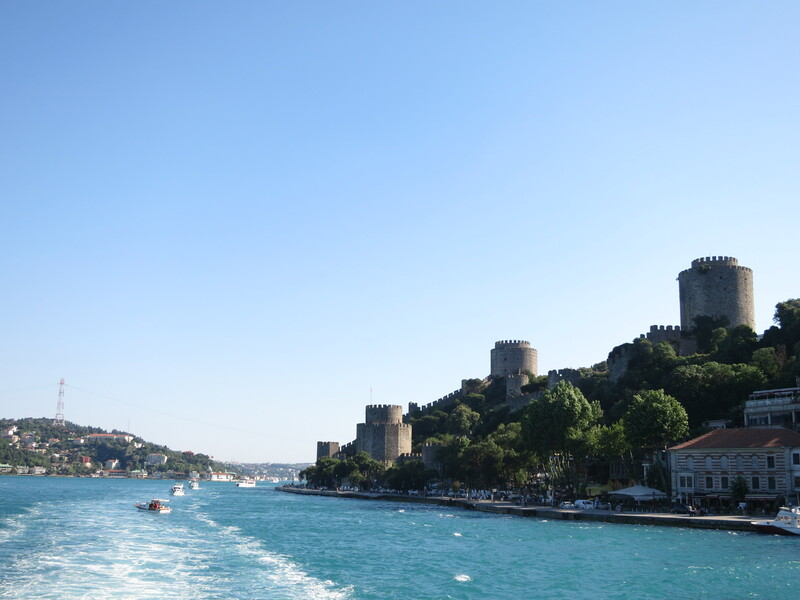 Rumelihisarı (the Rumeli fortress), viewed from the water on a Bosphorus Cruise.